The US space agency is exploring the possibility of developing a massively multiplayer online (MMO) game. 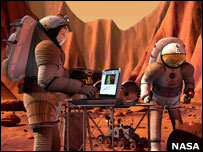 The virtual world would be aimed at students and would "simulate real Nasa engineering and science missions". The agency has published a "request for information" (RFI) from organisations interested in developing the platform. 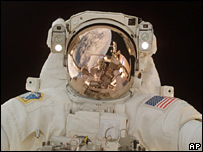 Nasa believe the game would help find the next generation of scientists and engineers needed to fulfil its "vision for space exploration". "A high quality synthetic gaming environment is a vital element of Nasa's educational cyberstructure," the RFI reads. Nasa already has a presence in the 3D virtual universe. The agency owns an island in Second Life where individuals and groups with an interest in the space programme can meet, share ideas and conduct experiments. CoLab, as it is called, is the brainchild of scientists at the Nasa Ames Research Center in San Francisco. The agency hopes that the environment could one day be used to allow the public to take part in virtual missions. "We at Nasa are working hard to create opportunities for what I might call participatory exploration," the director of the project, Simon Worden, has said. "We are looking at how this island can be a portal for all to fly along on space missions," he told delegates at the National Space Society's (NSS) conference last year. "When the next people step onto the surface of the Moon in a little over a decade, your avatar could be with them," he said. The latest proposal was published by Nasa's Learning Technologies Project Office which supports and develops education projects to promote science and technology. The document says that games are becoming increasingly important in education and could be useful for teaching a range of skills. "Virtual worlds with scientifically accurate simulations could permit learners to tinker with chemical reactions in living cells, practice operating and repairing expensive equipment, and experience microgravity," it says. The document calls for a game engine that includes "powerful physics capabilities" that can "support accurate in-game experimentation and research". "A Nasa-based MMO could provide opportunities for students to investigate science, technology, engineering, and mathematics career paths while participating in engaging game-play." Other organisations such as the US armed forces already use online gaming as a recruitment tool. America's Army for example introduces players to the "seven Army Core Values" and now claims to be one of "the most popular computer games in the world". Nasa has asked for interested organisations to respond to the request by the 15 February.